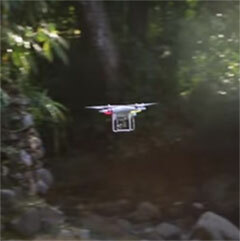 One of the latest techniques to help stop the spread of the Zika virus, Microsoft’s new Project Premonition is using drones to seek out the disease-carrying Aedes aegypti mosquitoes. By working with local government, drones deployed by Project Premonition search for the expected flow of Zika-carrying mosquitoes to the area in hopes to locate them before they spread the disease. The project itself wasn’t created solely for the Zika virus; it aims to detect numerous infectious disease outbreaks before they become widespread, with the goal of preventing major health disasters. The researchers expect that it will take several years to complete all the elements of the research, but the system currently is being used in the Houston area after Zika-infected mosquitoes were found in Florida. “Microsoft researchers are working with academic partners across multiple disciplines to develop the system, which collects and analyzes mosquitoes to look for early signs that potentially harmful diseases are spreading,” writes Microsoft’s Allison Linn on the company’s blog. The drones collect mosquitoes with their unique traps, which are designed to use less energy on lighter weight batteries. They have a bait system for luring mosquitoes and a sensor that automatically sorts the mosquitoes from the other bugs and chemicals that can preserve the mosquitoes for lab study. “Microsoft researchers are beginning to develop ways to make the drones more autonomous, and they also are working with Federal Aviation Administration officials on regulatory requirements,” Linn writes.